Our clinic wishes to give you the best possible care. We are happy to provide care to people of all nationalities, races, faiths, and lifestyles. We also want to show you the love of Christ so we can share with you the most important truth about Him. The Bible is God's Word to everyone about this most important truth, which concerns your salvation. Here are five places in the Bible that explain this clearly. Romans 3:23 "All have sinned and come short of the glory of God." Every person is a sinner, has done wrong, and therefore, is separated from God. This is because He is holy and perfect, and we are not. What will happen to the person who stays separated from God throughout life? Romans 6:23 "The wages of sin is death, but the gift of God is eternal life through Jesus Christ." This truth from God has some bad news and some good news. The word "death" refers to a definite place—hell—and tells a person that what they deserve because of their sin is eternity in hell. But the good news is that God offers eternal life in Heaven as a free gift (just like your clinic is a free clinic). This free gift can be offered you "through Jesus Christ." What did Jesus do, so that God can offer you the gift of Heaven? I Peter 3:18 "Christ once suffered for sin, the just for the unjust, that He might bring us to God; He was put to death in the flesh, but then rose again by the Holy Spirit." Jesus suffered for your sin when He was crucified on the cross. At that time your sin and my sin was placed upon Him, and He paid the penalty for it as our substitute. 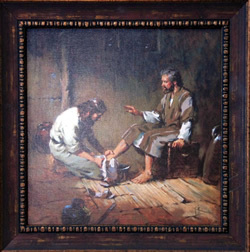 Only He could do this, because He was the sinless Son of God, the "just," and He did it for every person, the "unjust." Only He, by His death and resurrection (the last part of the verse) can bring us to God which overcomes the separation in Romans 3:23 above. When He brings us to God, all our sin is forgiven, we can live the rest of our lives with His love and help, and we can know that we will spend eternity in Heaven. This is what is meant by being saved. How then can a person be saved? Ephesians 2:8-9 "By God's grace, you are saved through faith...it is the gift of God, and not because of your works." Again, just as in Romans 6:23, salvation is a free gift, paid for completely by the death and resurrection of Jesus (God's grace—what he freely offers us that we do not deserve). A person is saved through faith alone, simply believing that when Jesus died, He paid the penalty for sin in our place for us. Salvation has nothing to do with works, which include being a member of any church, baptism, being good, or doing good. None of these can save, but are important after salvation. Since our salvation is a gift, one is saved simply by accepting the gift. A person does this by thanking God for His gift to you, and asking Him to save you because you believe Jesus died for you and you have forgiveness because He paid your penalty, something you could not do for yourself. John 3:16 "God so loved the world that He gave His only begotten Son that whoever believes in Him shall not perish but have everlasting life." Why would God send His Son Jesus to earth to die for our sin? Because He loves you so much and does not want any separation between you and Him. This separation is removed when you thank God for His gift and ask Him to save you because you believe Jesus died for you. If you would like one of our clinic volunteers to help you to tell God the way you feel, the way you believe, so that He can save you, please let us know your desire and we will be glad to pray with you.